Happy Christmas Me, Part 2. I am so lucky and thankful to have so many wonderful things, most of them not tangible, so my Christmas list reflects little chinks in my wardrobe and on my dressing table. I’m as happy to mix designer and high street with jewellery as I am with clothes, which is good as I have much more fun like that and a far, far less restricted budget, although I do love real the jewellery classics, pearls, diamonds and platinum, but gilding the lily with fake fripperies is fun too. Thanks to Yves Saint Laurent and his inspirational accessories muse, Loulou de la Falaise, I’ve had the best masterclass in mix and match fake jewellery trickery ever. I have found fabulousness in the aisles of Mango, TOPSHOP, Forever 21 and Urban Outfitters this season. Go on, root around, pile it on and don’t wear the same stuff two days running. You can wear it wrapped all around your wrists, dangling from your ears and in many coils around your neck. Put it all on with your t shirt and jeans, your fake fur, your leather or pleather anything, and utterly everything else that you own. I love masses of things jangling around my wrists, and I always wear a man’s watch. Makes my wrists look skinny! Please may I have scrupulously perfect and a little bit glamorous, sustaining and maintaining gifts, because it ain’t easy just retaining what I started with without battling to regain ground that nature wants to reclaim. Let us begin with the staving off of claw like appendages appearing at the end of my arms. Hand cream, that’s a bloody must have! Yet it doesn’t have to be all sensible and Atrixo like. ( No offence to my lovely Nana, who stoically kept that company afloat during her lifetime). Actually, It can be part of your ‘ come hither’ offensive. I have done my research, so lay back, slather and let L’Occitane’s Shea Butter hand cream do it’s thing. Makes your hands smell lickable in a good way, Hippolyta Beryl, faithful Blog Dog loves it. I’m thinking it could be that my Prince will feel compelled to kiss my hand at first whiff… Or if you’re more of a Scientist about things, maybe you should experiment with Hand Chemistry’s Intense Youth Complex hand cream . It purports to target the 8 signs of ageing hands, which is like trying to remember the names of all 7 Dwarfs. Anyway ’tis a glorious ointment with wizard effects. It is not a purse emptier either. Random I know, but the heart wants what the heart wants. So look at the above suggestions for me, to me. Tried this incredibly evocative scent whilst doing a trolley dash through Selfridges supposed to have been trying to buy a gift from the kitchen department. Oops, blimey how did I get here? Where am I? The Perfume department you say…Total OMG moment. French Kiss from Guerlain had me from the first spritz. This scent is my hearts delight in olfactory form. It hints at ruby red lipsticks encased in gold on my mother’s dressing table, where I hovered and had a sneaky peek when I was 5, lots of colourful flowers engendering reminiscences of powdery compacts, it’s call girls and black lace corsets, it’s ‘An elixir as spellbinding as a sensuous kiss’. For Lordy’s sake, this I want, I really, really want. The boots from TOPSHOP are just fun and I’m not sure that I can justify buying them myself, just because they really wouldn’t be alone on my shoe shelf ( alright, shelves). I would wear them all over the place, definitely jeans, definitely skirts, dresses, knee showing kit, definitely with my nighties that visit in the day. Everywhere, I’d wear them everywhere. 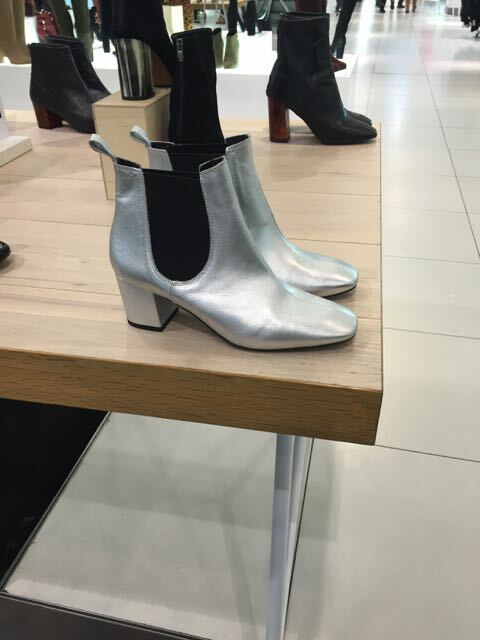 Definitely buy the silver boots! I’ve just sold my Zara ones on ebay sadly as, however, much pleasure I got from them, the pain was always greater (too narrow! ), They were madly admired every time I wore them though and looked amazing with a simple all-black outfit and perhaps one piece of silver jewellery. You may be genuinely surprised by the number of wears you get out of them! Just the confirmation/permission that I needed.Truly, that’s exactly how they’ll be paraded around. Also, lovely whites in the summer with slightly distressed silver boots ( because, let’s face it, I’ll have caned them by then), cool look. My grandmother thought that any shiny shoe, forget outright Silver, was immodest. You see there was always the chance that your knickers could be reflected in them. Victoria’s secret will be shared with the world!